Our local Salt Lake City plant is your best choice for fast, low-cost postcard printing and mailing services in Salt Lake City to anywhere in the State of Utah, as well as many parts of Idaho, Nevada and Montana. Fast & Affordable Postcard Printing & Mailing in Salt Lake City, Utah Made Easy! Our Salt Lake City plant is strategically located for fast postcard printing and mailing services to anywhere in the State of Utah, including Salt Lake City, West Valley City, Provo, West Jordan, Sandy Hills, Sandy, Ogden, Saint George & Layton, UT. Many cities in Idaho, Wyoming and Nevada are also a 1-day ship, including Rock Springs and Evanston, Wyoming, Idaho Falls, Pocatello and Twin Falls Idaho. With a plant in Salt Lake City, Summit Printing is your best choice for fast postcard printing and mailing services with low postage rates in Utah, as well as Idaho, Nevada and Montana. Our Salt Lake City plant is strategically located for fast postcard printing and mailing to anywhere in the State of Utah, including Salt Lake City, West Valley City, Provo, West Jordan, Sandy Hills, Sandy, Ogden, Saint George & Layton, UT. 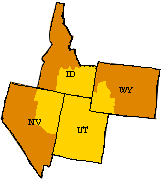 Many cities in Idaho, Wyoming and Nevada are also a 1-day ship, including Rock Springs and Evanston, Wyoming, Idaho Falls, Pocatello and Twin Falls Idaho.